Seismographs are instruments designed to detect and measure vibrations within the earth, and the records they produce are known as seismograms. Like the many other terms beginning with this prefix, these words derive from the Greek seismos, meaning "shock" or "earthquake." Although certain types of seismographs are used for underground surveying, the devices are best known for studying earthquakes. A seismograph consists of a pendulum mounted on a support base. The pendulum in turn is connected to a recorder, such as an ink pen. When the ground vibrates, the pendulum remains still while the recorder moves, thus creating a record of the earth's movement. A typical seismograph contains 3 pendulums: one to record vertical movement and two to record horizontal movement. Seismographs evolved from seismoscopes, which can detect the direction of tremors or earthquakes but cannot determine the intensity or the pattern of the vibration. The earliest known device used to detect earthquakes was created by a Chinese scholar, Chang Heng, around A.D. 132. Detailed accounts reveal that it was a beautiful and ingenious apparatus consisting of a richly decorated copper cylinder with eight dragon heads positioned around its upper circumference, facing outwards. Fixed around the lower circumference, directly beneath the dragon heads, were eight copper frogs. In its mouth, each dragon held a small ball that dropped into the mouth of the frog below it when a rod inside the cylinder, flexible and weighted at its upper end, was triggered by an earthquake. The particular frog that captured a fallen ball indicated the general direction of the earthquake. For over seventeen hundred years the study of earthquakes depended on imprecise instruments such as Chang Heng's. Over the centuries a wide variety of seismoscopes were constructed, many relying on the detection of ripples in a pool of water or liquid mercury. One such device, similar to the frog and dragon mechanism, featured a shallow dish of mercury that would spill into little dishes placed around it when a tremor occurred. Another type of seismoscope, developed during the eighteenth century, consisted of a pendulum suspended from the ceiling and attached to a pointer that dragged in a tray of fine sand, moving when vibrations swayed the pendulum. During the nineteenth century, the first seismometer was constructed; it used various types of pendulums to measure the size of underground vibrations. The first true seismograph may have been a complex mechanism designed by the Italian scientist Luigi Palmieri in 1855. This machine used tubes filled with mercury and fitted with electrical contacts and floats. When tremors disturbed the mercury, the electrical contacts concurrently stopped a clock and triggered a device that recorded the movements of the floats, roughly indicating both the time and the intensity of the earthquake. The first accurate seismographs were developed in Japan in 1880 by the British geologist John Milne, often known as the father of seismology. Together with fellow expatriate scientists James Alfred Ewing and Thomas Gray, Milne invented many different seismological devices, one of which was the horizontal pendulum seismograph. This sophisticated instrument consisted of a weighted rod that, when disturbed by tremors, shifted a slitted plate. The plate's movement permitted a reflected light to shine through the slit, as well as through another stationary slit below it. Falling onto light-sensitive paper, the light then inscribed a record of the tremor. 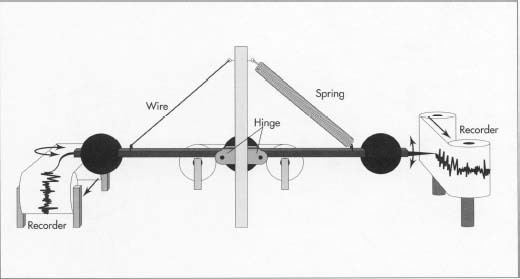 Today most seismographs still rely on the basic designs introduced by Milne and his associates, and scientists continue to evaluate tremors by studying the movement of the earth relative to the movement of a pendulum. The first electromagnetic seismograph was invented in 1906 by a Russian Prince, Boris Golitsyn, who adapted the principle of electromagnetic induction developed by the English physicist Michael Faraday during the nineteenth century. Faraday's law of induction postulated that changes in magnetic intensity could be used to generate electric currents. Incorporating this precept, Golitsyn built a machine in which tremors cause a coil to move through magnetic fields, thereby producing an electrical current which is fed into a galvanometer, a device that measures and directs the current. The current then fluctuates a mirror similar to the one that directed the light in Milne's apparatus. The advantage of this electronic system is that the recorder can be set up in a convenient place such as a laboratory, while the seismograph itself can be installed in a remote location. This flow chart shows the steps involved in seismograph manufacture and installation. The main material used is aluminum, followed by normal electrical equipment composed of copper, steel, glass, and plastic. The basic unit comprises a pendulum inside an airtight container that is attached by a hinge and a wire (for horizontal units) or a spring (for vertical units) to a supporting frame set firmly in the ground. development during modern times has been the implementation of seismograph arrays. These arrays, some consisting of hundreds of seismographs, are linked to a single central recorder. By comparing the discrete seismograms produced by various stations, researchers can determine the earthquake's epicenter (the point on the earth's surface directly above the origin of the quake). Today, three types of seismographs are used in earthquake research, each with a period corresponding to the scale of the vibrations it will measure (the period is the length of time a pendulum requires to complete one full oscillation). Short-period seismographs are used to study primary and secondary vibrations, the fastest-moving seismic waves. Because these waves move so quickly, the short-period seismograph takes less than a second to complete one full oscillation; it also magnifies the resulting seismograms so that scientists can perceive the pattern of the earth's swift motions. The pendulums in long (intermediate) period seismographs generally take up to twenty seconds to oscillate, and they are used to measure slower-moving waves such as Love and Rayleigh waves, which follow primary and secondary waves. The WWSSN currently uses this type of instrument. The seismographs whose pendulums have the longest periods are called ultra-long or broad-band instruments. Broad-band seismographs are used increasingly often to develop a more comprehensive understanding of global vibrations. The components of a seismograph are standard. The most important material is aluminum, followed by normal electrical equipment composed of copper, steel, glass, and plastic. A modern seismograph consists of one or more seismometers that measure the vibrations of the earth. A seismometer comprises a pendulum (an inert mass) inside an airtight container that is attached by a hinge and a wire (for horizontal units) or a spring (for vertical units) to a supporting frame set firmly in the ground. One or more electric coils is attached to the pendulum and placed within the field of a magnet. Even miniscule movements of the coil will generate electrical signals that are then fed into an amplifier and a filter and stored in computer memory for later printing. A less sophisticated seismograph will have either a mirror that shines light onto light-sensitive paper (as in Milne's seismograph), a pen that writes with quick-drying ink upon a roll of paper, or a heat pen that marks thermal paper. The demand for earthquake seismographs is not that high; it can be met by a few manufacturers who design custom-made seismographs to meet the needs of particular researchers. Thus, while the basic components of the seismograph are standard, certain features can be adapted to serve specific purposes. For instance, someone might need a more sensitive instrument to study seismic events thousands of miles away. Another seismologist might select an instrument whose pendulum has a short period of only a few seconds so as to observe the earliest tremors of an earthquake. For underwater studies, the seismograph would have to be submersible. 1 A site might interest a seismologist for a number of reasons. The most obvious one is that the region is earthquake-prone, perhaps because it is adjacent to a fault or fracture in the earth's crust. Such fractures dislodge one of the blocks of earth adjoining them, causing the block to shift higher, lower, or horizontally parallel to the fault, and leaving the area vulnerable to further instability. A seismograph might also be installed in a region currently without one, so that seismologists can gather data for a more complete picture of the area. 2 Although some seismographs are placed in university or museum basements for educational purposes, the ideal location for earthquake research would be more remote. To record the earth's seismic movements more accurately, a seismograph should be, placed where traffic and other vibrations are minimal. In some cases, an unused tunnel can be appropriated. Other times, a natural underground cavern is available. Seismological researchers may even choose to dig a well and place the instrument inside if no other underground hole exists where a seismograph is deemed desirable. An above-ground seismograph is also possible, but it must rest above a solid rock foundation. While horizontal seismometers contain a pendulum attached to a wire, vertical units use a spring instead. When the ground vibrates during an earthquake, the pendulum remains still while the recorder moves, thus creating a record of the earth's movement. Some recorders consist of a coil that generates an electrial signal, which in turn is stored in computer memory for later printing. A less sophisticated seismograph will have either a mirror that shines light onto light-sensitive paper, a pen that writes with quick-drying ink upon a roll of paper, or a heat pen that marks thermal paper. between electric coils. Next, the coils are wired to printed circuit boards and placed inside the seismograph body. 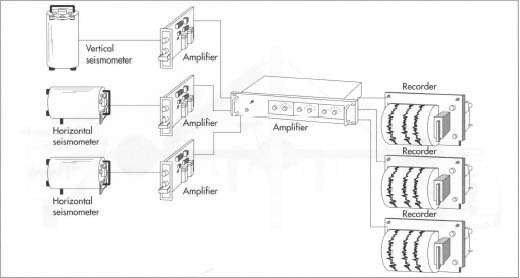 The whole unit can in turn be connected to a digital audio tape recorder, which receives the current generated by the coils and transferred to the circuit boards. If the data recording equipment consists of more traditional equipment, such as a roll of paper and a pen, these are now attached to the unit. Depending on the final destination, the seismograph is shipped by truck or plane in a cushioned crate by transporters experienced in moving delicate electronic equipment. 4 A seismograph intended for educational purposes might be bolted into the concrete floor of a basement, but research seismographs are best situated far from the inevitable vibrations of a building. They are either installed directly onto the bedrock in instances where great precision is required, or in a bed of concrete. In both cases, earth is removed and the ground leveled. In the second instance, a bed of concrete is poured and allowed to set. 5 After the base has been prepared, the seismometer unit is bolted into place. In some instances where great sensitivity is required, it will be housed in a vault where the temperature and humidity are controlled. The seismometer unit is usually installed in the chosen field, cavern, or vault, while the amplifiers, filters, and recording equipment are housed separately. 6 In modern seismology, it is typical to have several seismometer units arrayed at a distance from one another. Each seismometer unit sends signals to a central location, where the data can be printed out and studied. The signals may be broadcast from an antenna built into the unit, or, in more sophisticated units, beamed up to a satellite. A typical seismograph contains 3 pendulums: one to record vertical movement and two to record horizontal movement. The seismometer unit is usually installed in a field, cavern, or vault, while the amplifiers and recording equipment are housed separately. being installed and before being put to work. Qualified computer programmers also test the software for bugs before shipment. While sensitivity and accuracy are important, timing is also critical, particularly in earthquake prediction. Most modern seismographs are connected to an atomic clock that is calibrated to Universal Time (formerly called Greenwich Time), thus insuring highly accurate information that all researchers can understand. Another critical aspect of quality control with modern seismographs is minimizing human error. While earlier seismographs were simple, and practically anyone could learn how to use them, contemporary seismographs are precise, sensitive devices that are complex and difficult to use. Today, seismograph researchers and workers must be trained by engineers and scientists from the manufacturing facility if they are not already qualified engineers and scientists themselves. They must learn how to run and maintain the seismograph as well as all auxiliary equipment such as a computer. Seismology is best known for the study of earthquakes. Its emphasis has not been on theoretical study of the earth's structure, but rather on predicting and lessening the impact of earthquakes in vulnerable regions. Study of the earth's interior has been directed towards searching for oil deposits, testing for ground instabilities before construction, and tracking down subterranean nuclear explosions. Earthquake prediction, however, is foremost. If researchers can determine beforehand that a quake will take place, precautions such as increasing hospital and safety personnel can be scheduled. The first official earthquake prediction issued by the United States government took place only in 1985. Hence, earthquake prediction is in its infancy. Recent major earthquakes such as the one that occurred in San Francisco in 1989 have intensified study of the San Andreas fault. Currently, a team of seismologists is studying the Parkfield segment of that fault to determine if they can predict a minor earthquake. The data from this attempt could come in handy to predict major earthquakes in more heavily populated areas. Other developments include more sensitive and more durable seismographs that can record both long and short period waves. One earth scientist believes that an earthquake warning system could be set up. Such a system would require a seismograph to pick up the vibrations, a computer to interpret them as an imminent earthquake, and a communication system to warn emergency personnel in time. Some experts envision large arrays of seismographs in earthquake-prone areas, where individual seismograph owners could collect and transmit data to seismologists. Bolt, Bruce A. Earthquakes: A Primer. W. H. Freeman and Company, 1978. Eiby, George A. Earthquakes. Van Nostrand Reinhold, 1980. Golden, Frederic. The Trembling Earth: Probing and Predicting Quakes. Charles Scribner's Sons, 1983. Iacopi, Robert. Earthquake Country. Lane Books, 1971. Vogt, Gregory. Predicting Earthquakes. Franklin Watts, 1989. Walker, Bruce. Earthquake. Time-Life Books, 1982. Lindh, Allan G. "Earthquake Prediction Comes of Age," Technology Review. February/March 1990, pp. 42-51. "[Interview with] Allan Lindh," Omni. March, 1991, pp. 68-71. "The Amateur Scientist," Scientific American. July, 1957, pp. 152-162. Van Dam, Laura. "Reducing Disasters During Earthquakes," Technology Review. February/March 1990, pp. 12-13.